This work determines the degree to which a standard Lambda-CDM analysis based on type Ia supernovae can identify deviations from a cosmological constant in the form of a redshift-dependent dark energy equation of state w(z). 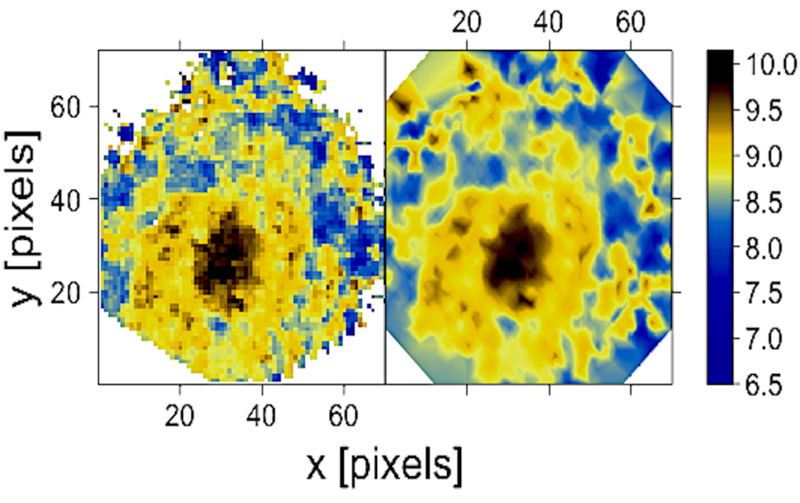 We demonstrate that a standard type Ia supernova cosmology analysis has limited sensitivity to extensive redshift dependencies of the dark energy equation of state. In addition, we report that larger redshift-dependent departures from a cosmological constant do not necessarily manifest easier-detectable incompatibilities with the Lambda-CDM model. 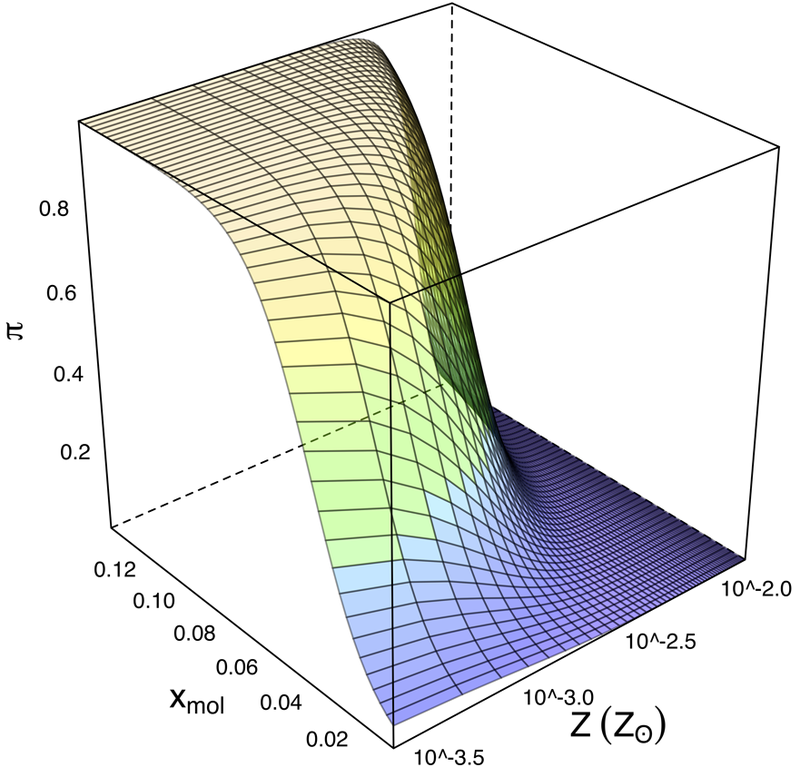 We show that the baryonic fraction and the rate of ionizing photons appear to have a larger impact on fesc than previously thought. A naive univariate analysis of the same problem would suggest smaller effects for these properties and a much larger impact for the specific star formation rate, which is lessened after accounting for other galaxy properties and non-linearities in the statistical model. Active Learning is a class of algorithms that aims to minimize labeling costs by identifying a few, carefully chosen, objects which have high potential in improving a given machine learning classifier. In this project, we show how Active Learning can be used as a tool for optimizing the construction of spectroscopic samples for supernova photometric classification. 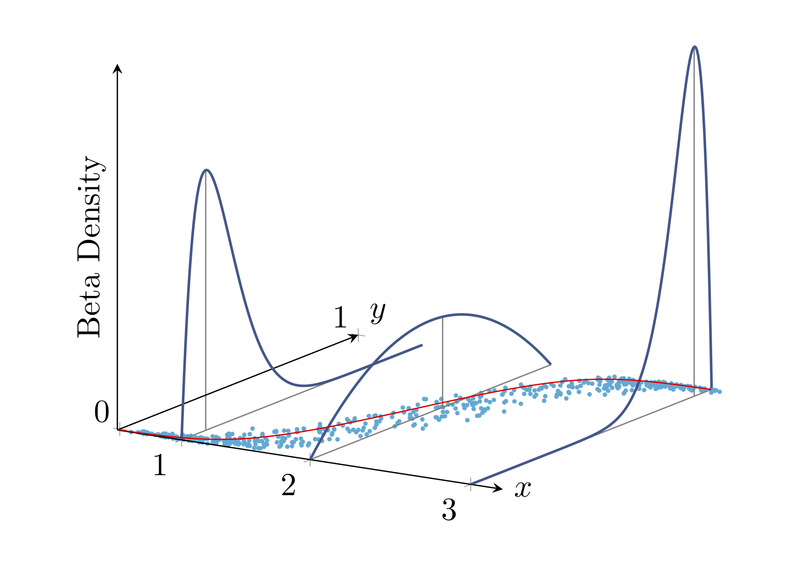 We introduce a novel technique to model IFS datasets, which treats the observed galaxy properties as manifestations of an unobserved Gaussian Markov random field. 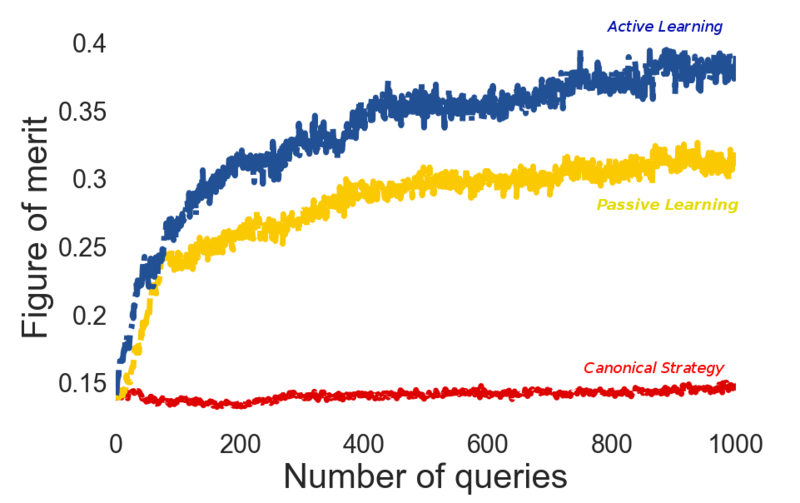 The method is computationally efficient, resilient to the presence of low-signal-to-noise regions, and uses an alternative to Markov Chain Monte Carlo for fast Bayesian inference - the Integrated Nested Laplace Approximation. The proposed Bayesian approach enables the creation of synthetic images, recovery of areas with bad pixels, and an increased power to detect structures in datasets subject to substantial noise and/or sparsity of sampling. 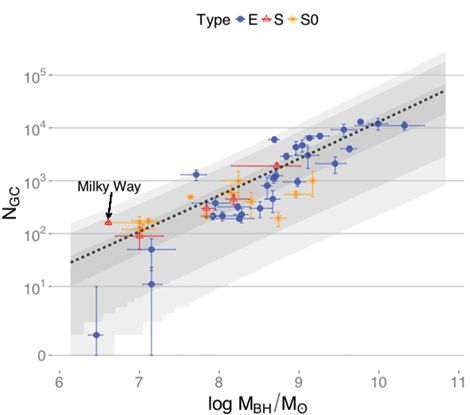 Here, we show how to use a Gaussian mixture model (GMM) to jointly analyse two traditional emission-line classification schemes of galaxy ionization sources: the Baldwin-Phillips-Terlevich (BPT) and the WHAN diagrams, using spectroscopic data from the Sloan Digital Sky Survey Data Release 7 and SEAGal/STARLIGHT datasets. We apply a GMM to empirically define classes of galaxies in a three-dimensional space spanned by the log [OIII]/H-beta, log [NII]/H-alpha, and log EW(H-alpha) optical parameters. We demonstrate the potential of our methodology to recover/unravel different objects inside the wilderness of astronomical datasets, without lacking the ability to convey physically interpretable results; hence being a precious tool for maximum exploitation of the ever-increasing astronomical surveys. We present two galaxy catalogues built to enable a more demanding and realistic test of photo-z methods. We demonstrate the potential of these catalogues by submitting them to the scrutiny of different photo-z methods, including machine learning (ML) and template fitting approaches. Our catalogues represent the first controlled environment allowing a straightforward implementation of such tests. We developed a hierarchical Bayesian model to investigate how the presence of Seyfert activity relates to their environment. In elliptical galaxies, our analysis indicates a strong correlation of Seyfert-AGN activity with the cluster centric distance, and a weaker correlation with the mass of the host. 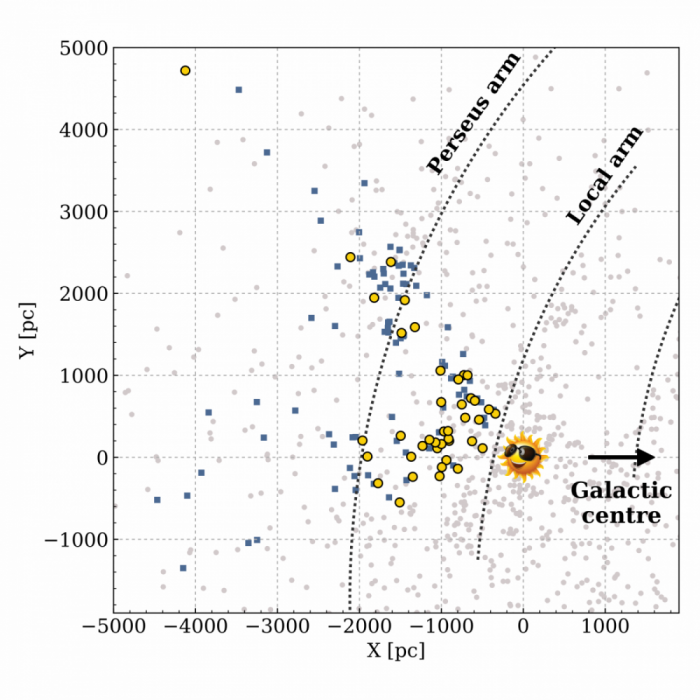 In spiral galaxies these trends do not appear, suggesting that the link between Seyfert activity and the properties of spiral galaxies are independent of the environment. 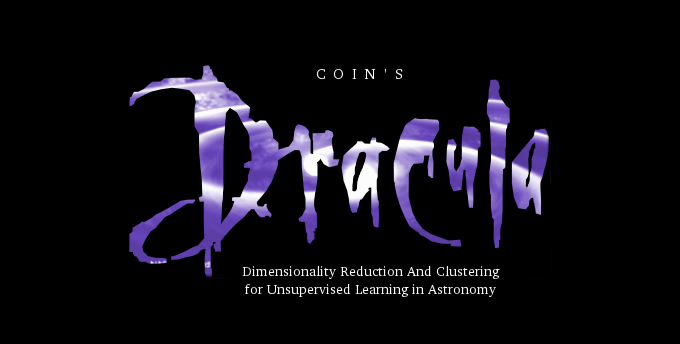 DRACULA classifies objects using dimensionality reduction and clustering. The code has an easy interface and can be applied to separate several types of objects. It is based on tools developed in scikit-learn, with Deep Learning usage requiring also the H2O package. 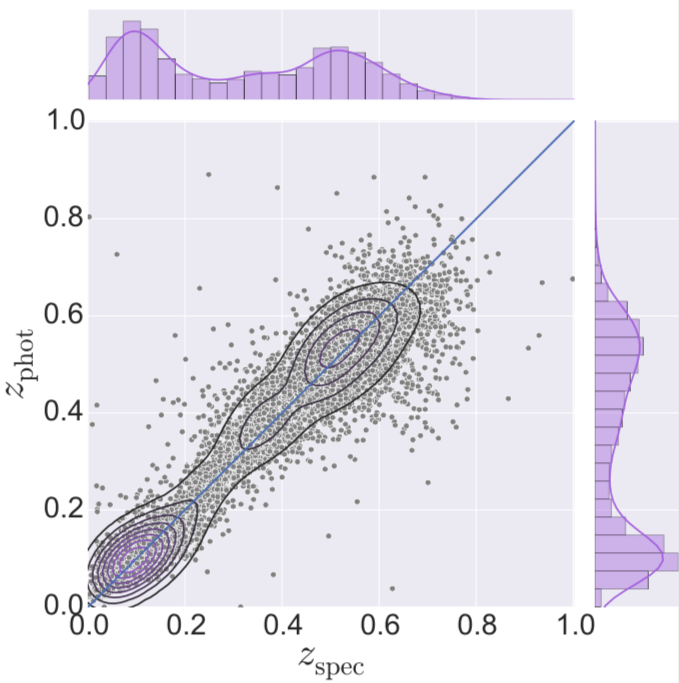 We show how it can be used to identify sub-classes of type Ia supernovae. 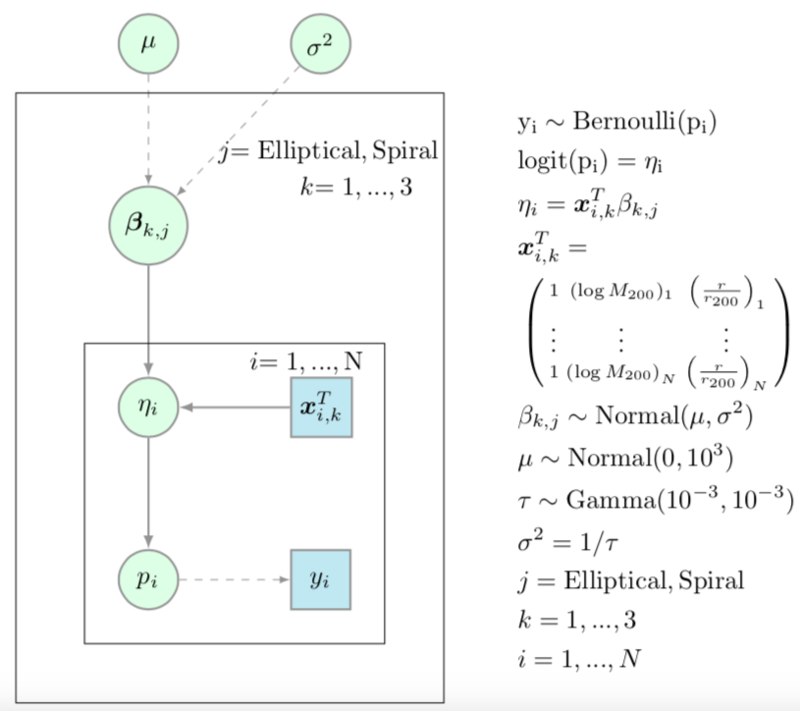 Approximate Bayesian Computation (ABC) enables parameter inference for complex physical systems in cases where the true likelihood function is unknown, unavailable, or computationally too expensive. 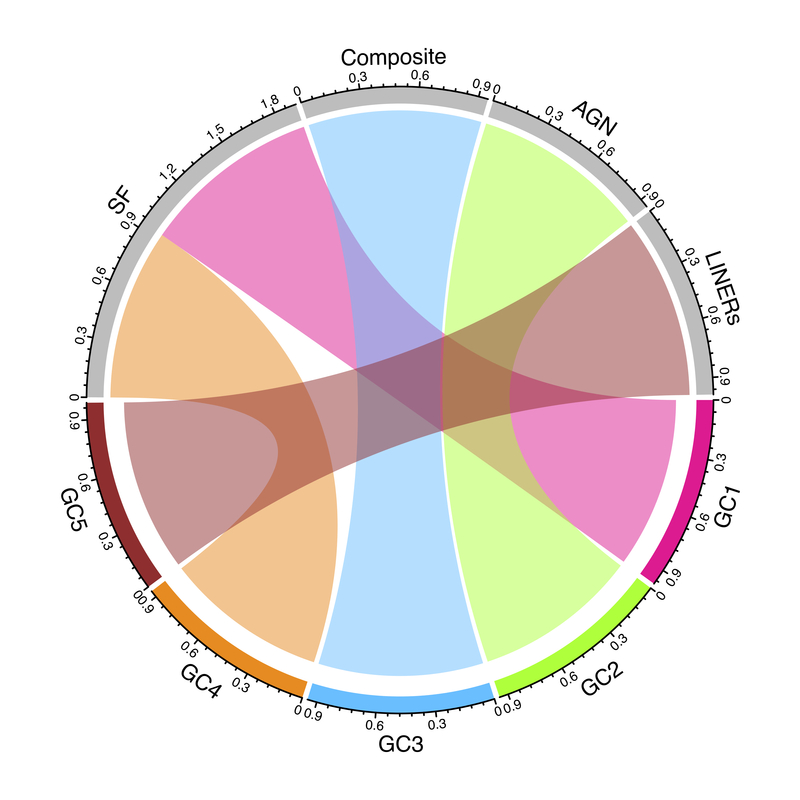 Here we present COSMOABC, a Python ABC sampler featuring a Population Monte Carlo variation of the original ABC algorithm, which uses an adaptive importance sampling scheme. AMADA allows an iterative exploration and information retrieval of high-dimensional data sets. This is done by performing a hierarchical clustering analysis for different choices of correlation matrices and by doing a principal components analysis in the original data. Additionally, AMADA provides a set of modern visualisation data-mining diagnostics. The user can switch between them using the different tabs. We elucidate the potential of the class of GLMs which handles count data. The size of a galaxy's globular cluster (GC) population (NGC) is a prolonged puzzle in the astronomical literature. It falls in the category of count data analysis, yet it is usually modelled as if it were a continuous response variable. 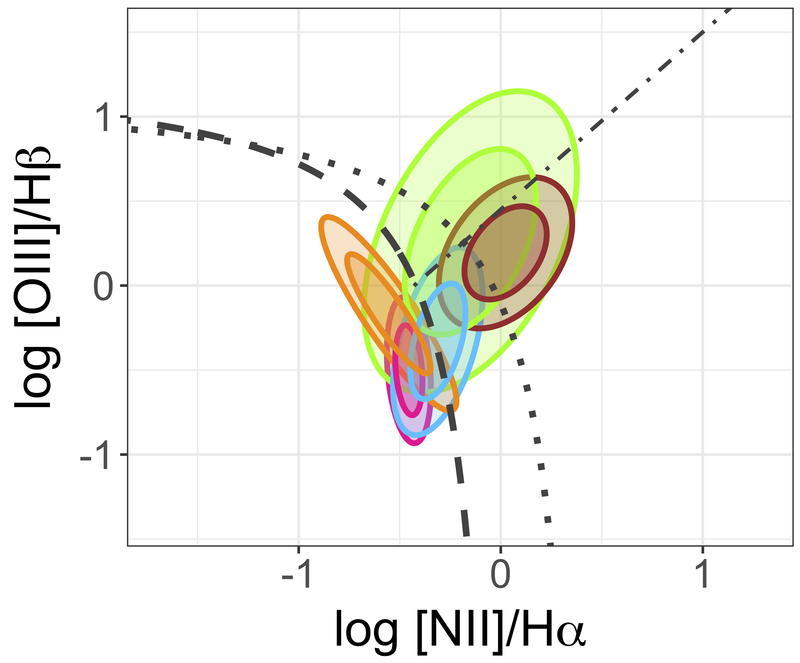 We have developed a Bayesian negative binomial regression model to study the connection between NGC and the host galaxy properties. 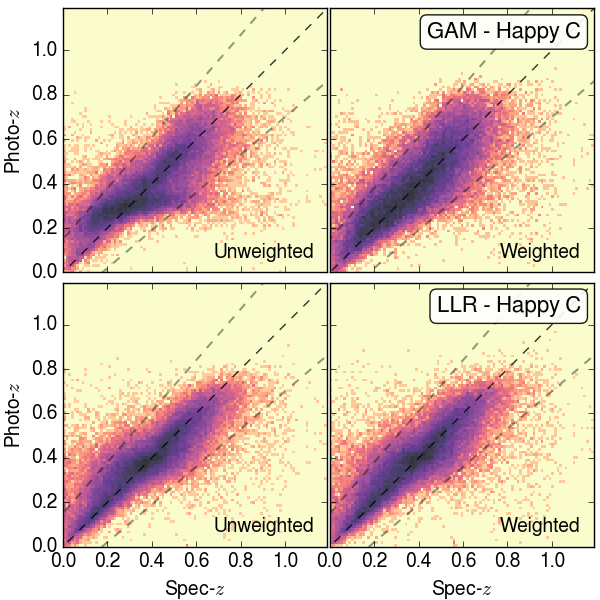 We present a gamma regression model as a fast alternative method for estimating the photometric redshifts of galaxies from their multi-wavelength photometry. Using the gamma family with a log link function we predict redshifts from the PHoto-z Accuracy Testing simulated catalogue and a subset of the Sloan Digital Sky Survey from Data Release 10. We elucidate the potential of the so-called logit and probit regression techniques, from both a maximum likelihood and a Bayesian perspective. As a case in point, we explore the conditions of star formation activity and metal enrichment in primordial minihaloes from cosmological hydro-simulations including detailed chemistry, gas physics, and stellar feedback.